While those who regularly experience head, neck, and jaw pain may benefit from practicing this sequence two or three times a week, those without pain might practice it a few times a month to keep discomfort at bay. Naturally, if any of the poses or exercises in this sequence feel especially valuable to you, feel free to repeat those daily, while on a break during the course of your workday or as part of your regular yoga practice. For this sequence, you will need a wall, a strap, a hand towel, and an extra yoga mat or blanket. You may also want blocks or a chair to sit on for the mobilizations in number 8 and a “rad rod” or another type of massage roller (or even a rolling pin from your kitchen drawer) for the self-massage described in number 9. An eye pillow is an option in savasana. In order to bring your head and neck closer to neutral and increase postural awareness, practice mountain pose with the help of a wall. Stand with your back against the wall and your feet a couple inches away from the wall. Roll your shoulders up and back; then move your shoulder blades down your back and closer to each other, aiming to make a crease between them. 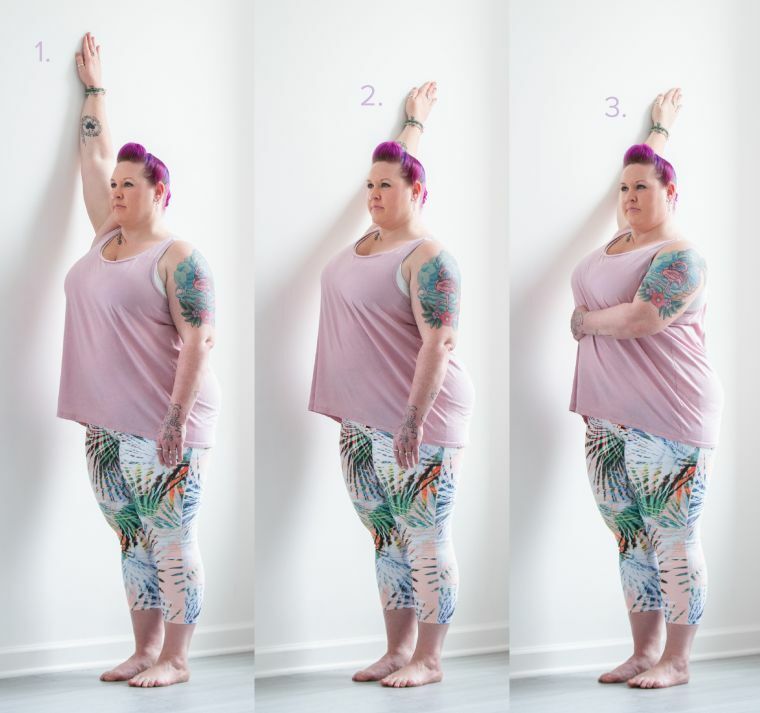 Take your arms out to your sides, palms facing forward, and press the backs of your hands against the wall. Notice which parts of your body are touching the wall. 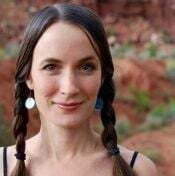 • Lengthen the back of your neck by tucking your chin in slightly. • Retract your neck by moving your chin (and thus your head) straight back. Bring the back of your head toward the wall only as much as you can while keeping the back of your neck long. Stay here for several deep breaths, memorizing this alignment, which may feel like you are “falling backward” if you are accustomed to forward-head posture. According to Reif, if the shoulders are rolling forward and down, it is difficult if not impossible to bring the head and the neck into their ideal neutral alignment. In order to make it easier to take your shoulders back, stretch your pectorals (chest muscles that are often tight for those with forward-head posture) with the shoulder clock. 1. Stand in mountain pose with the posture you practiced in number 1 with the right side of your body six inches or so away from the wall. Reach your right arm straight up, palm on the wall, fingers toward the ceiling. Think of this as noon on an imaginary clock. Hold here for a few deep breaths. 2. Walk your arm back slowly to move forward on the clock by an hour or two, to a point where your arm is reaching back on a diagonal and you feel a valuable stretch across the right side of the chest. (For many students, this is somewhere around two o’clock.) If you are experiencing tingling or numbness, it may help to step a little further away from the wall, and/or bend your elbow slightly. 3. To increase the stretch, bring your left hand to the right side of your rib cage, and use it to help you spin the right side of your rib cage forward instead of allowing your chest to turn back toward your right arm. Hold here for several deep breaths, and then repeat both arm positions on the left side. This pose stretches the chest and strengthens the rhomboids and posterior deltoids: muscles that help to keep the shoulders aligned. 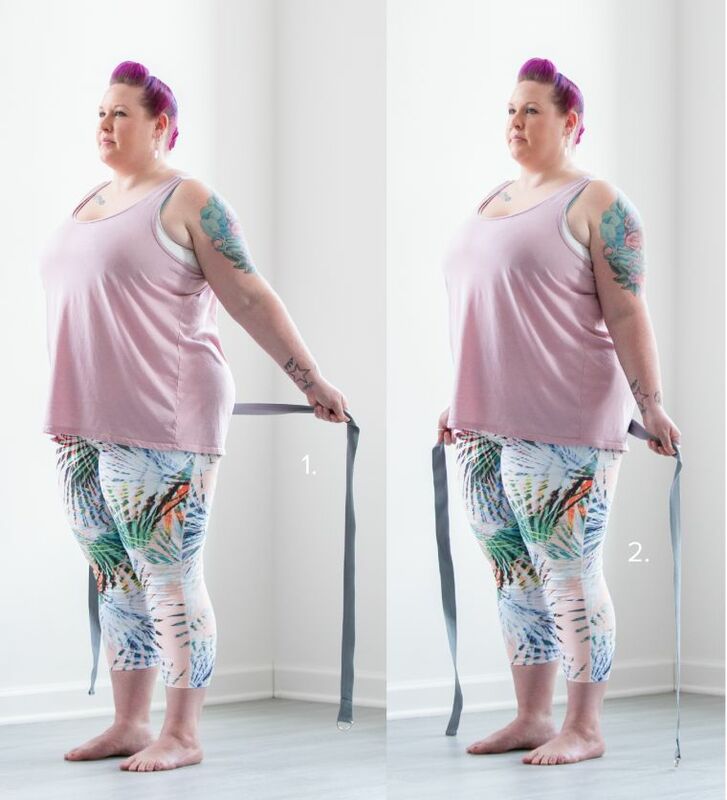 Step away from the wall, pick up your strap, and return to mountain pose, taking hold of the strap behind you with your palms facing forward and your hands a little wider apart than hip distance. 1. Keeping your wrists flat and your collarbones broad (i.e., without letting the tops of your shoulders fall forward and down), on a long, slow exhale, draw your belly in and lift your arms behind you. 2. Over the course of a long, slow inhale, lower the strap. 1. Standing tall in mountain pose, roll your shoulders back to broaden your collarbones, then bring the index finger and middle finger of your right hand to your chin. Inhale here. On your exhale, lightly press your chin in and move it straight back, aiming to bring your ears in line with your shoulders while keeping the back of your neck long. Inhale here. With your right fingers still touching your chin, bring your left hand to the back of your head, fingers pointing down toward the nape of your neck. 2. On an exhale, with the help of your hands, nod your head, drawing your chin in more. “The feedback and the gentle nudge provided by the hands often enable us to move further and with more ease than we otherwise would,” say Reif. On an inhale, lift the chin just slightly. Repeat these “nods” three to five more times, moving with the breath. This backbend stretches the chest and strengthens the upper back. Come to all fours on your yoga mat; then lower yourself onto your belly with your arms straight out to the sides, hands in line with your shoulders. With your chin tucked and nose hovering just above the floor, make “hitchhiker thumbs”: turn your palms to face forward, curl your fingers toward your palms, and point your thumbs up toward the ceiling. The pinky-finger side of your fists can rest on the floor. Lift your shoulders toward your ears, and then move your shoulder blades down your back and toward each other, trying to make a crease between them. 1. On an inhale, lift only your hands and arms up toward the ceiling. Repeat these arm lifts, moving with your breath, about ten times. The next time you lift your arms up, also lift your head and heart (look at the floor just in front of your mat to keep the back of your neck long). Hold locust pose with your legs on the floor for several breaths; then lower down with control on an exhale. Repeat locust pose with arms lifted out to the sides two or three times. Child’s pose relaxes the lower back after the preceding backbend and offers a chance to release facial tension. Stay here for several deep breaths, imagining the gentle pressure of the mat (or prop) against your forehead helping you to release any tension there. Check that your jaw is unclenched and that the muscles around your eyes and between your eyebrows are relaxed. From child’s pose, walk your hands back toward you, and come to an upright seat in thunderbolt pose (vajrasana). Alternatively, sit in hero pose (virasana) on blocks or in a chair. Lengthen your spine, roll your shoulders back, and align your ears with your shoulders again. 1. Place your right hand on your right ear. Try to press your head to the left with your hand, but resist this movement with your head, pressing your right ear back against your right hand. Hold for two or three full breaths, without allowing any actual movement. Repeat this three or four times on the right, leaving your right hand where it is, but relaxing for a breath or two between these intentional contractions. 2. Then move to the left side for the same number of repetitions. 3. Bring both palms to your forehead, fingers pointing up. Press your hands into your forehead as if trying to encourage the neck to extend (backbend). Resist this movement with your head, pressing your forehead into your hands as if trying to flex your neck (bow your head forward), for two or three breaths. Repeat this three or four times, relaxing between repetitions but keeping your hands in place. 4. Interlace your hands behind your head, and try to press your head forward with your hands. Resist this movement with your head, pressing your head back against your hands. Hold for two or three breaths. Repeat this three or four times, pausing between repetitions. 5. Place your right hand on your right cheek. Press your right hand against your right cheek as if you are trying to get your head to turn to the left, but press your head back against the right hand as if you are trying to look over your right shoulder. Do not actually move your head. Hold this resistance for two or three breaths. Repeat these contractions three or four times on this side, pausing between repetitions. 6. Then repeat for the same number of repetitions with your left hand on your left cheek. Repeat A, B, and C in that order three to five times. Still seated, in thunderbolt, on a block or blocks, or in a chair, loop your hand towel around the base of your neck, and bring your hands to either end of the towel, just in front of your chest. 1. Pull the towel forward and down, as if trying to get your lowest cervical vertebrae to move inward. Inhale here. 2. On an exhale, tuck your chin in and move your neck back against the towel, bringing your head and neck an inch or two back (or as far back as you can go without strain). 1. 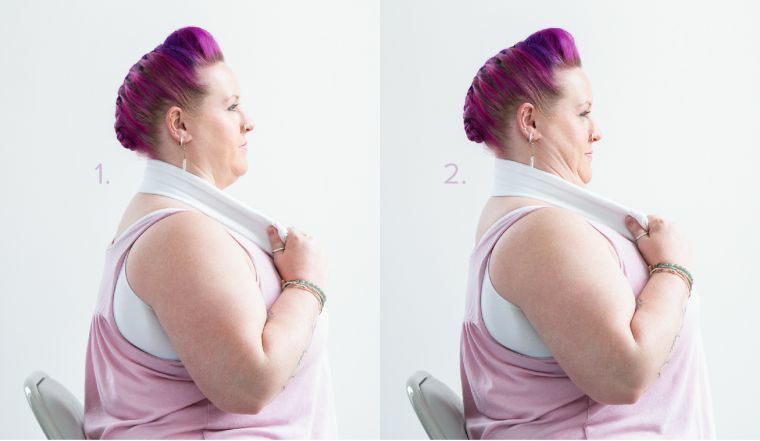 With the neck retracted (as above), keep the towel around the base of your neck, and continue to apply a gentle pressure to keep your lowest cervical vertebrae moving inward. 2. On an inhale, lift your chin, looking up only as far as you comfortably can. 3. On an exhale, return your head and neck to their neutral position. 1. Keeping your head and neck in their neutral position and your hand towel around your neck, crisscross your right wrist on top of your left and grab hold of just the corners of the towel. With your left hand, pull down on the towel to anchor it. With your right, lift the towel until it covers your left cheek and jaw. Inhale here. 2. On an exhale, gently pull up with your right hand, using the towel to lift the left side of your jaw and lower your right ear toward your right shoulder. Then, still being very gentle, use the towel to guide your head to turn toward the right. Look over and above your right shoulder. 3. On your inhale, come back to center, releasing the pressure, lowering the towel, and gazing forward. 4. 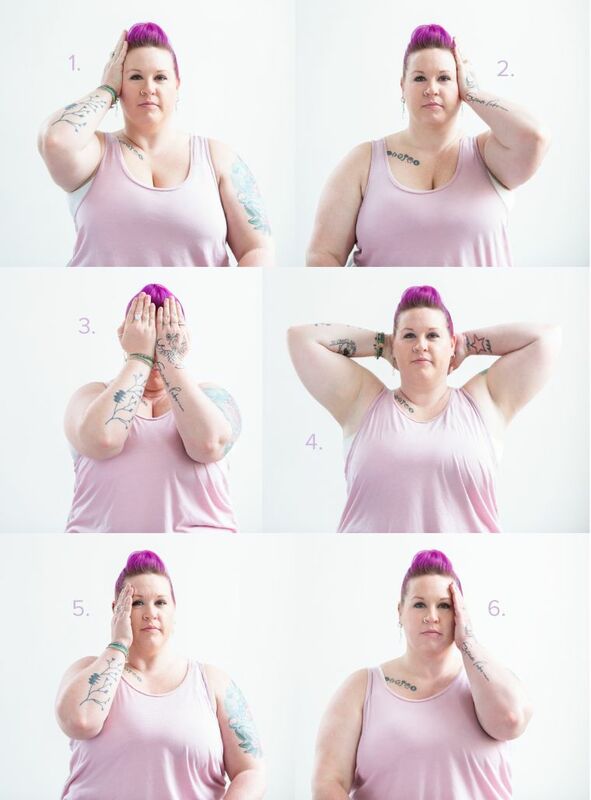 Change the crossing of your wrists, placing your left wrist on top of your right, and repeat the pose, lifting the right side of your jaw and turning your head to the left with the towel. Get rid of any remaining tension by massaging your neck. 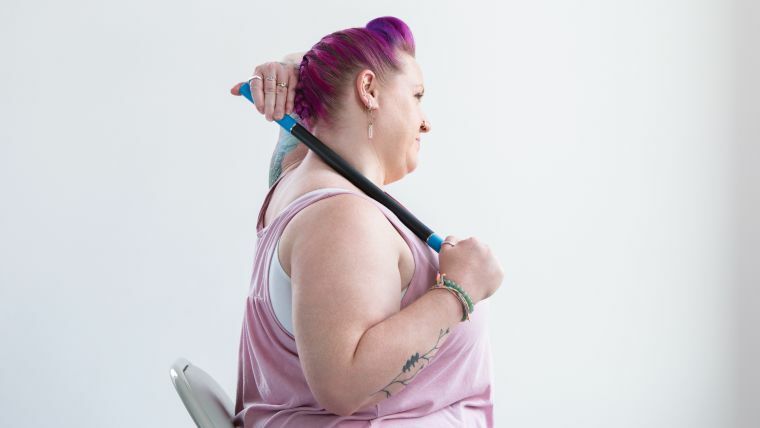 If you are using a rolling pin (which will not have the padding of a massage roller), you can drape your towel over the side of the neck you are massaging for a little extra cushioning. Still seated comfortably, take a hold of your rad rod or rolling pin. Roll your shoulders into place and retract your neck until your ears are in line with your shoulders. Lift your head back to upright and repeat on the other side, tipping your right ear toward your right shoulder, then massaging the left side of your neck for several breaths. 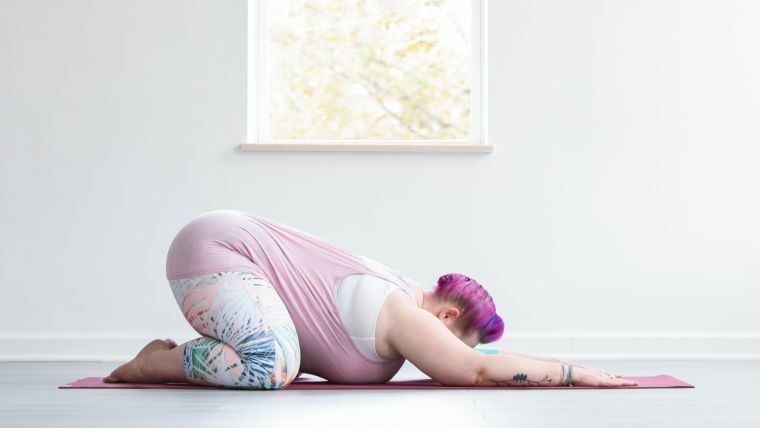 This restorative pose, for which you will need a blanket (or an extra yoga mat, rolled up) aims to passively move the thoracic spine in, lift the chest, and drop the shoulders. Roll your blanket or mat into a long cylinder. Place this roll lengthwise along the yoga mat you’re practicing on, and lie down on the roll so that it supports you from your lumbar spine to the back of your head. Ideally, your head and neck are in their neutral position, ears in line with the shoulders. But if that causes the back of your neck to shorten and your chin to lift, place additional padding (such as a folded blanket) underneath the back of your head. You can drape your arms out to the sides and allow your legs to drop open away from each other. Relax here for one or two minutes. To make savasana even more relaxing, consider using an eye pillow. From supported fish, roll to one side to remove the blanket roll from underneath your spine, and then return to lying on your back. Feel free to place a folded yoga blanket under your head if the back of your neck shortens and your chin tips up toward the ceiling when you relax on your back. Place an eye pillow over your eyes if you like; then drape your arms out to the sides, palms up, and let your legs and feet flop open, away from each other. As you breathe easily here for several minutes, imagine any remaining tension in your head, jaw, and neck dissipating. Reif also advises taking frequent short breaks to stand and/or move, since those who are more sedentary tend to have more neck pain. Perhaps, on each of those microbreaks, you could even do one or two of the exercises suggested here.